The consolation final was against a Wallner (AUT). He plays long, high balls with a lot of spin (especially on his backhand, as he doesn’t tape his racquet). I was too eager at first, as his shots were relatively loose. Well placed returns and shots, surpriced me close to the baseline (actually just inside after my serves, which is just so wrong.., I know..😁) Lost the first set, consequently. The doubles later on, was mine and Sarah Hunter’s (CAN) opportunity to redeem ourselves, after the close-but-not-quite tiebreak loss the other day. The last and deciding set/match-tiebreak (to 10, used in doubles games on the tour..) was really tight. We were up 7-4, lost to 7-7. Finally we had a match point at 9-8. My experienced, (former world #2) partner was to serve two points… The anticipation was high, as the receiver was quite tired, from what what we could tell.. Disappointed, and quite shocked/angry/sad for a while (as this was so close to my greatest tennis success thus far)… Cooled down and felt better the day after (I had already reminded both myself and Sarah: ”play as a team, lose as a team…”). I helped my partner to warm up for her singles final the next day… Sarah had helped me to reach my greatest game play ever, after all, so no (t too) hard feelings 😊😄😉. Practise play and a very entertaining men’s open final’s game followed. Homeward bound after two excellent tennis tournaments. Merci Beaucoup, île de Ré. Me and former singles world #2 in the quad class (the mixed class for less mobile players), Sarah Hunter (CAN), were up in the first match of the round-robin doubles, against Solna team mate Jansson (SWE) and former world #3 Raffaele (ITA). I played great, actually.. Played topspins at the back and in the middle, and even some nice backhands with proper length. I have got to remember this grip and the way I held my racquet…(I use one grip for all strokes, taping my hand onto the racquet, for those not knowing)..
First four games were no-ad’s, as sometimes in doubles (no advantage points, but one deciding point at 40 all. (1-3). We lost the first set 2-6, sadly despite great points from both of us (the service mistakes were actually not mine for once…) We had mostly even games. I’ve never played better!!! I’ll enjoy this for a bit, savour the moment, along with the comment from my doubles partner (former world #2!) Sarah Hunter: You played great! Singles consolation (first round losers) tomorrow. Really tough, given the wheelchair rugby playing Austrian Wallner’s relatively mild disability. I came here very late on Sunday after the entire day at airports. Nantes-Amsterdam-Rome-Alghero (Sardinia). Nice training sessions though, on both Monday and Tuesday, with both old and new friends. Walking distance from the hotel.. A big plus..! I had my tactics well defined: to avoid Mr Green’s (GBR) strong topspin forehand and to make him move a lot across the court (as he drives a power-chair (using his racquet-hand), in which it’s quite difficult to change directions swiftly).. I started out great, moving a lot (the moment you stop rolling and attacking the ball, you’re often too late), being 2-0 up. Then I gave him a few too many easy shots, and perhaps I didn’t move back to the far back of the court as much after my shots.. There were quite a few advantage games, and long rallies (felt stupid when he lobed me, though). A really nice tournament, given that you adjust to the French organising attitude of laisser-faire/whatever happens happens (that they never understood that everyone wants help to move the chairs onto the courts, and that it seems like a surprise to them, every single time, that everyone wants bananas and water during their games. Small things, but a bit annoying with peoples’ gold fish memories, when you’d rather focus on your game preparation. It is an international ITF2 after all..😁. Aside from that, and the expensive lodgings, I loved it here. The consolation (first round losers) game against Alves (FRA) started 8.30, my legs freezing from the cold in my tennis shorts. I started out great, 2-0, but was a bit too happy with some shots, not moving when the returns surprised me. A poor shot then often was the result on my part. From 2-3 onwards, we were neck-and-neck. I had several 40-0 service (!) games (the last one of the set ended with a nice killer-volley ”Edberg-style” from me..😃), but he out-manouvred me in several of his service games. I managed to break his last service game and won 7-5. In the second set I focused on his serves being the same slice or straight all the way through, while focusing on calm shots at the empty spaces of the court, as he didn’t move that quickly. This proved successful (don’t complicate things..😊). A comfortable 7-5, 6-1 win, in my best (strategic) game ever. 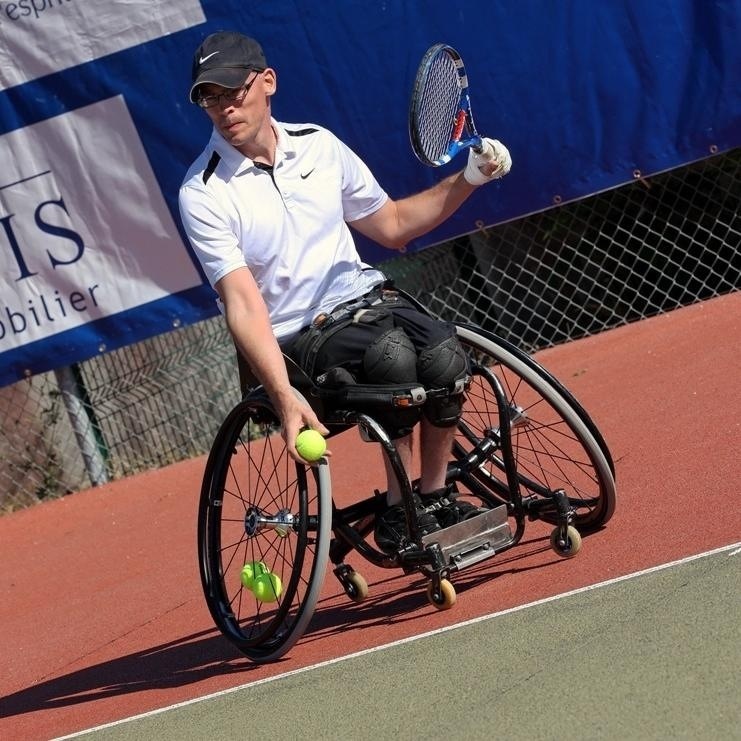 Consolation finals on Saturday against my hard-hitting doubles partner Richard Green (GBR), in his power-chair. The first game started great. I focused on calm strokes on Jance’s (FRA) backhand, aiming for the back of the court. I was up 2-0, moving really well, but then I started hesitating before his shots. I ended up waiting for his shots rather than moving my chair aggressively. His relatively well placed serves and aggressive shots then took the better of me. Some great games including an advantage point at 2-3, but I just wasn’t moving well enough. In the second set, I stopped moving completely, it seems. A nice lesson, with some improvements, but let’s forget the other half of the game and my lame serves throughout..😒. Salut! Got up at 3 am, in order to be on the beautiful French island of île de Ré in the afternoon. Lovely place in the Atlantic, where summer still applies. The draw took place in the town of Ste Marie de Ré in some historic building(s). Lots of white low houses, green plants all over the place, the odd alló alló-type café, and a market place. Not to mention the vinyards… Lots to see and experience if you’d brought your own car.. The draw was interesting but difficult. I’m up against my best French friend Séb Jance. He’s more consistent than me, but I won a set off him not too long ago..